Austin Birks FCILT, Chair, CILT Bus & Coach Forum. Chief Executive, Travel de Courcey, Adrian de Courcey. 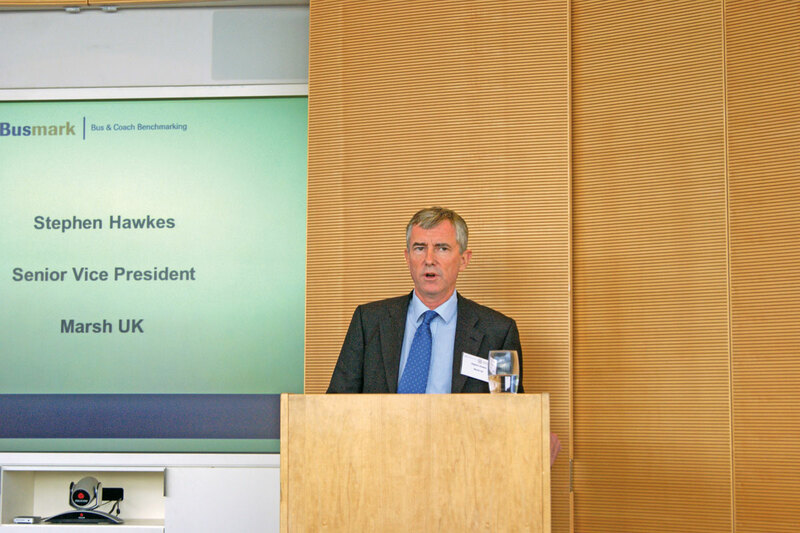 Stephen Hawkes, Senior Vice President, Marsh UK. Reading Buses CEO, Martijn Gilbert. Mike Weston, Director of Buses, TfL. 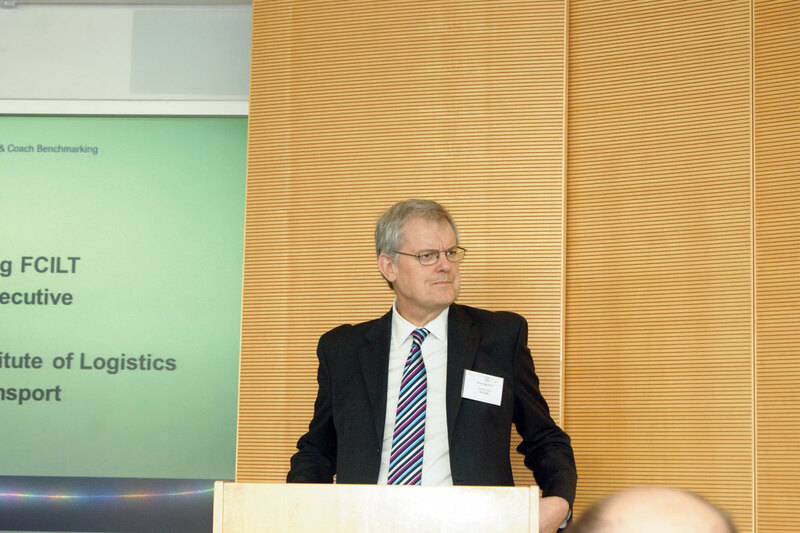 Joe Grogan, CEO Corporate Business - UK & Ireland, Marsh UK. CILT Chief Executive, Steve Agg. 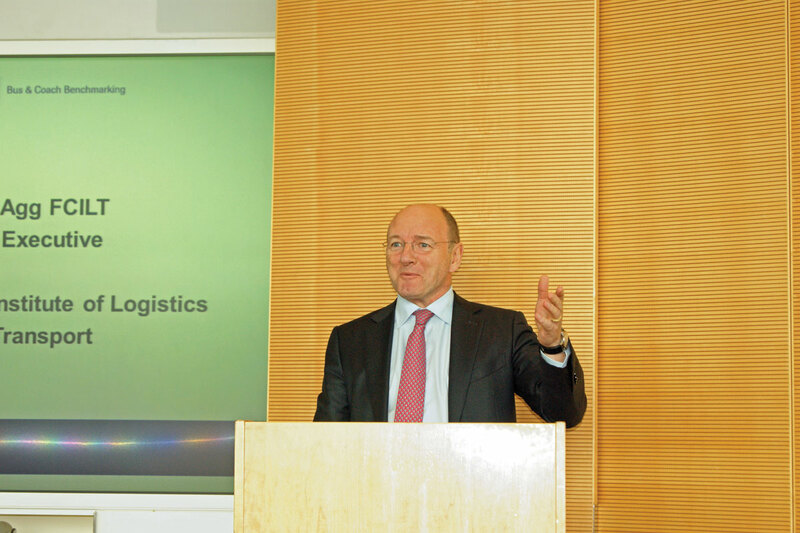 After a successful launch at ALBUM earlier this year, the CILT (Chartered Institute of Logistics and Transport) Busmark industry benchmarking scheme had its first ever Member Meeting recently. 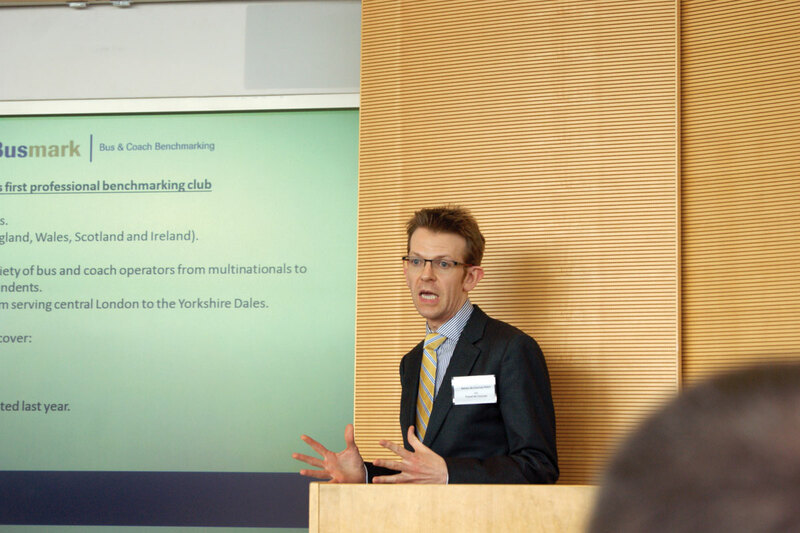 Chris Peat attended the event at insurance specialist Marsh’s London offices, at which the first set of results gathered by the scheme was revealed. 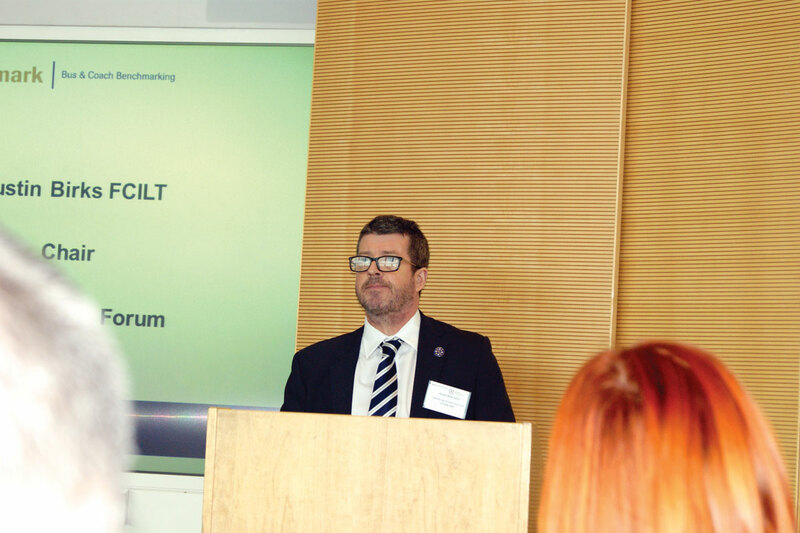 After opening remarks from CILT Chief Executive, Steve Agg and Joe Grogan, CEO Corporate Business – UK & Ireland, Marsh UK (one of Busmark’s Gold sponsors), Mike Weston CMILT, TfL’s Director of Buses, was first to speak. Recording data on London’s buses was a key concern of Mike’s, with the authority recording a blend of operational and customer metrics. TfL is no stranger to benchmarking, being part of the International Bus Benchmarking Group (IBBG). Established in 2004, this organisation takes in figures from 14 major cities across the globe, with all analysis by Imperial College London. IBBG membership gives TfL external assurance and rigour in the data collected, as well as encouraging continuous improvement and building a network of comparators. A key thing that must be observed with benchmarking, from Mike’s experience, is confidentiality. He said the IBBG makes a lot of effort to ensure like-for-like data is collected amongst its participants. He also emphasised the importance of ensuring the information from Imperial College is available to all involved in providing bus services in London. Mike said Busmark offers the industry the chance to ‘leverage benefits through sharing’ and he suggests operators take part in it. 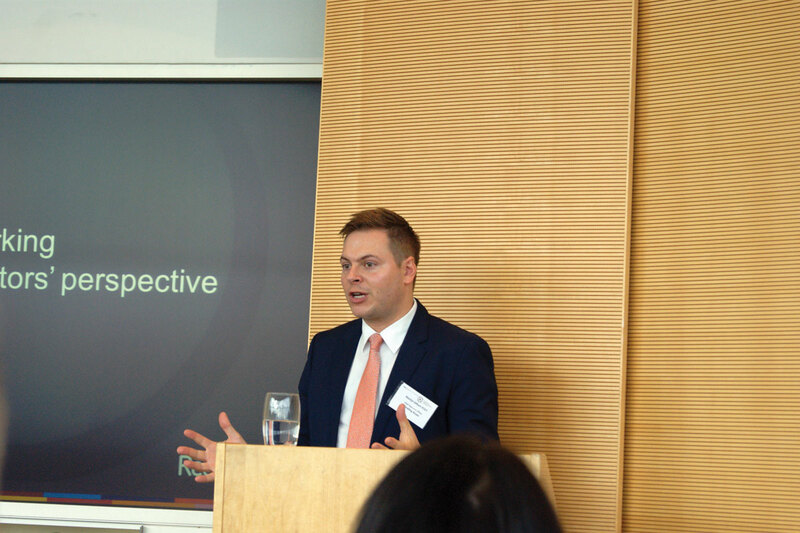 Marsh’s Senior Vice President, Stephen Hawkes, explained how his company uses data to calculate client’s risk and how it can be used to help buy an insurance programme. Using the Marsh Analytics Platform (MAP), the business is able to look at trends in risks, which it compares to existing clients’ figures, all in order to see how the insurer’s situation might look in the future. Some of the fundamental questions Marsh asks clients include: how much risk can your firm tolerate and is the company adequately protected? It looks at customers’ risk tolerance (their ability to retain the financial impact of any risk), it also reviews their ‘risk appetite’ (their willingness to deal with a risk themselves) and looks at the cost of retaining the risk versus the price of transferring it. Most only look at the economic cost of the risk, according to Stephen. The idea is the business examines how best to use capital – even considering whether it would be better for the client to finance the risk themselves. Measuring is one thing, but how do you know ‘what good actually looks like’? Benchmarking is the answer, according to Martijn. Relating back to his period in the rail industry, it was standard for ‘common performing measures’ to be made, showing how well you perform against the rest of the industry. He said that with this practice, it is important recordings are made to a set standard, to ensure ‘you are comparing apples to apples and eggs to eggs’. Busmark helps, he said, in that it is the first all encompassing benchmark for the PCV industry. It is ‘accessible to all levels’, with participants able to submit whatever information they wish, from the smallest KPI (Key Performance Indicators) to a ‘complex suite’ of data. ‘It is ‘all about driving improvement’ and ‘gaining confidence in your strengths’, as well as identifying areas that need work. It also ‘promotes ourselves’, particularly in terms of when bidding for tenders. Martijn drew to the audience’s attention that many benchmark to some degree already, with DfT, Transport Focus and CPT all doing similar research. With Busmark, ‘now is the time to do it properly in the industry’. Adrian de Courcey FCILT, Chief Executive of Travel de Courcey, gave us what we were all here for: the results of the inaugural Busmark survey. The data took into account the 27 member companies, who operate out of a total of 104 depots with 20,000 employees and a combined fleet size of 8,000 that covers 147m miles per year. It was found that a participating company’s average PVR comprises 80% of the total fleet size, whilst the best performing operators’ PVR represents 91% of the total fleet. The average fleet age was worked out as 6.1 years old. 96% of operators’ vehicles passed their MOT first time, with three members in the survey having a 100% first time pass rate. Only one respondent outsourced their maintenance. The average mpg of fleets was calculated at 8.03mpg. There were 576 hybrid and fully electric buses operated by the respondents and the use of solar and wind power, as well as biomass, were all commonly reported as being used. Social media is being used extensively too, with 70% of operator’s having a corporate Twitter and/or Facebook account. The combined total of followers on Twitter amongst all of them was 142,091, with 62,000 friends on Facebook. Participants’ fleets were on average 87% DDA compliant, with six members’ at 100%. Disability awareness and equality training had been rolled out to 81% of the participants’ drivers. Adrian claimed the figures showed clear diversity in the workforce. Females comprised 12%, which he said showed the industry was getting a better gender mix. The majority, 82%, had English as their first language. It was revealed 15% of employees identified themselves as from ethnic minorities, with a greater ethnic mix present in urban operations, up to 50%. There were some ‘bleak demographics’ though. Only 1% of the participants’ employees were in the 16 – 19 age range, whilst 20 – 44 year olds made up 30%, 45 – 64 year olds comprised 55% and 9% were 65 or older. Only 1% were apprentices. Adrian said this was a ‘ticking time bomb’ and raises questions such as who will be driving the vehicles in 2035? Is the answer automated vehicle systems? He said it was ‘very unsettling’ for us as an industry. In addition to the results delivered to the audience, each Busmark member received a personal results pack, which showed where they stood compared to the rest of those involved. With her usual energy, leader of campaign group Greener Journeys, Claire Haigh, explained her organisation’s mission. She said the group is focusing on the economic benefits of buses, with an emphasis on how they can play a part in towns and cities becoming engines for growth. She said transport is no longer an irrelevant department in the government, it is now ‘absolutely crucial’. Sustainable transport is going to be decisive in the future, she said, with mass based transport like buses the key to travelling efficiently. She said that when people use the bus, they realise it is a ‘fantastic product, we have to sell it’. Buses underpin three main pillars of sustainability: economic, social and environmental. 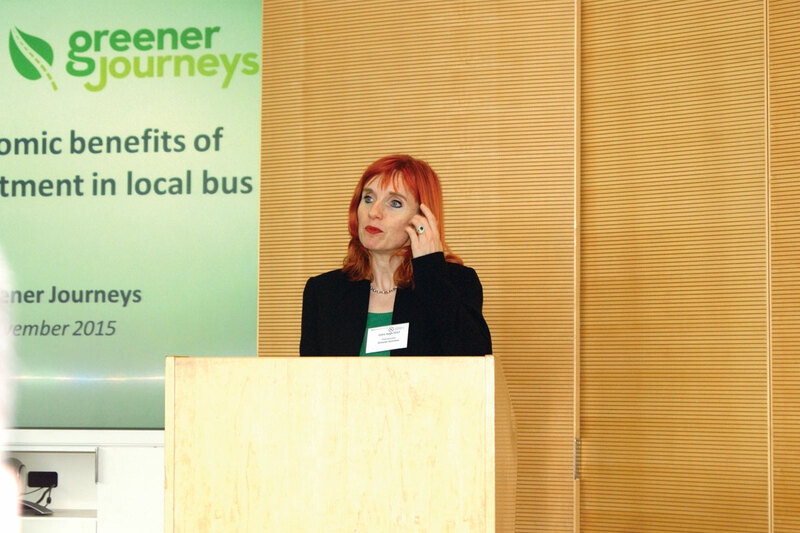 She outlined some research Greener Journeys has commissioned, which illustrated the ways buses support the economy. One figure was that one in ten would be forced to get another job if their bus into work was cancelled. She said investment in bus related infrastructure and priority measures generates £3.32 of social, economical and environmental benefits for every £1 spent. A new study from Greener Journeys is imminent, which should shed more light on the social importance of buses. 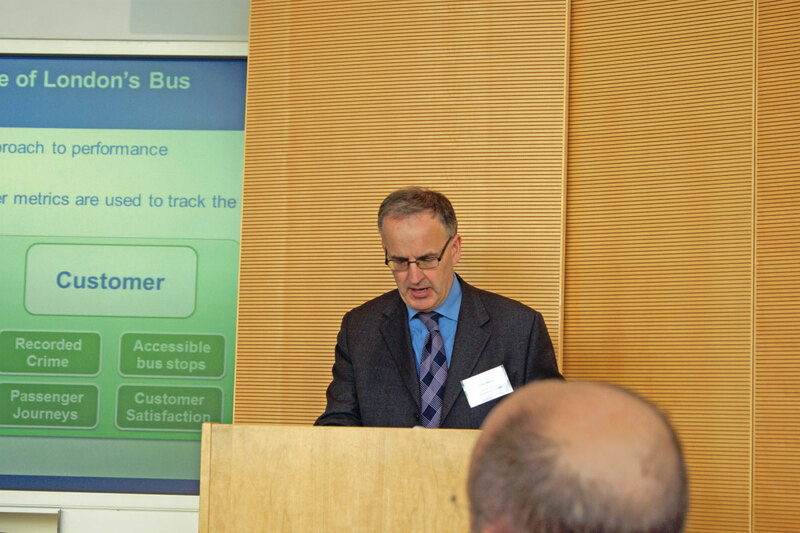 Described as the leader of the ‘bus renaissance’ by Steve Agg, Austin Birks FCILT, Chair, CILT Bus & Coach Forum, paid thanks to those whose efforts had enabled the launch of Busmark. This included Giles Fearnley and Roger French, who were among the ‘well respected and high flying’ people who helped start the scheme. Sir Peter Hendy, who wrote to London operators to gain their interest, was also thanked. Launched with eight companies, it now encompassed 28, which Austin said showed the desire of operators to engage in such a scheme. He likened it to the beginning of a process of evolution for the industry. It is an ‘open church’, meaning all operators of buses and coaches could join, the aim being to promote value. He also thanked the 15 corporate members who are involved in Busmark. Finally, Austin thanked Steve Agg, who will be ‘hanging up his hat’ as Chief Executive within weeks, saying he will be leaving behind a ‘great legacy’.